I often wonder just how I would have done my job(s) before the advent of an internet that puts more or less whatever information I might need right at my fingertips. The answer, of course, applies to any question about how we did things in an earlier technological era: we would've had to talk to someone. Some of us would've had to talk to a librarian, just like the ones The New York Public Library has employed (and continues to employ) to research and respond to any questions people need answered. 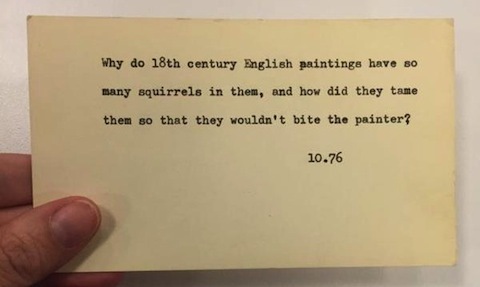 The internet, as it happens, has loved #letmelibrarianthatforyou, the hashtag the New York Public Library started using on Instagram to identify the unusual such questions it fielded in the 20th century. 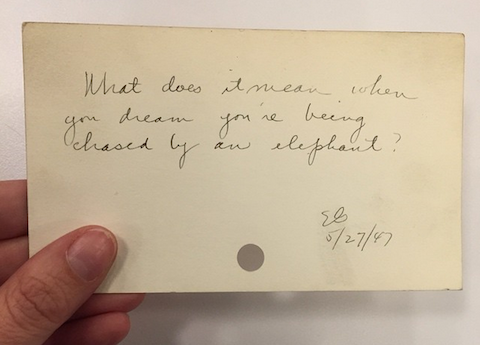 Their recent discovery of a box of notecards filled with preserved questions from the 1940s through the 80s, photographs of which they now post on a regular basis, has provided a clear window onto the human curiosity of days past — or rather, the instances of human curiosity that librarians found curious enough to preserve in their box labeled "interesting research questions" and kept behind the desk. Search technology, of course, hasn't yet made human consultants of every kind obsolete; there are more Googleable and less Googleable questions, after all. Examples of the former include 1962's "What is the gestation of human beings in days?" ("I was born on 1/29/62," replies one commenter. "Maybe my mother was getting impatient! 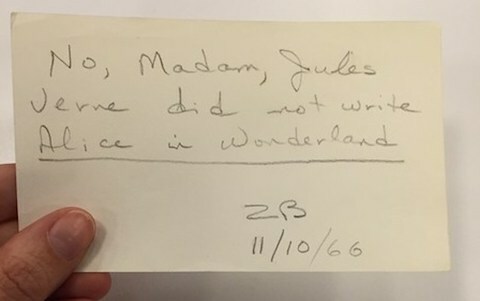 "), 1966's query about whether Jules Verne wrote Alice's Adventures in Wonderland, and the undated "Are Plato, Aristotle, and Socrates the same person?" Some patrons, on the other end of the spectrum, preferred to ask the unanswerable: one needed the solution to "the riddle of existence," and another called in pursuit of The Oxford Ornithology of American Literature. 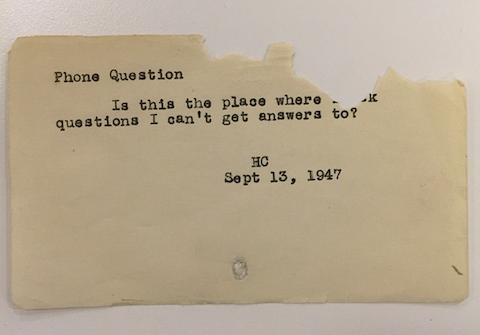 Even if the librarians couldn't help out these inquisitive people of the mid-20th century, I do hope they found a way to satiate your curiosity. It almost makes me want to see what modern humanity is Googling right now. Wait, no — I said "almost." What Questions Would Stephen Fry Ask God at the Pearly Gates? I have complete the Master’s Degree from department of Information Science and Library Management of Dhaka University in Bangladesh. i WANT TO JOB RELATED FILED. HELP ME ANYBODY. For many years the Information Desk at Auburn University’s Foy Union has been the answer source for many questions. A few years ago a the Today show did a short piece on the service. As of this comment the service is still active. So if Google doesn’t know try Foy.